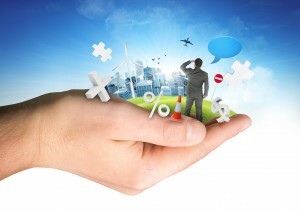 Uncertainty is widely recognised as a potential drag on economic growth. Workers who become more uncertain about their future wages reduce spending, for example, and business owners uncertain about future government policy hold back on investing. 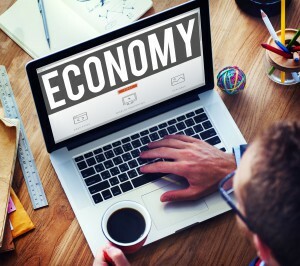 However, new research from the Reserve Bank of Australia (RBA) shows that uncertainty isn’t responsible for Australia’s recent weak economic growth. But uncertainty could negatively impact the economy in the future, as it currently is in America, if governments aren’t clearer about their future policies. Uncertainty is caused when consumers, business people and policymakers aren’t able to predict changes in any number of things that affect their decision making, such as wages, technology and the economy. An “uncertainty shock” is a sudden increase in uncertainty due to an event with unknown consequences, such as an election or government budget. Take the 2016 US presidential elections as an example. The consequences of Donald Trump’s election were unknown – what would happen to international trade or the US commitment to climate change protocols? While this theory is sound, it may not be relevant to understand the booms and busts of Australia. Most of the research on uncertainty has neglected countries like Australia, perhaps because of the solid economic growth since 1992. Economic growth is now slowing. And spikes in uncertainty have been found to negatively affect business cycles in several countries. This means we need to understand what part government policy and international events play in the economy. 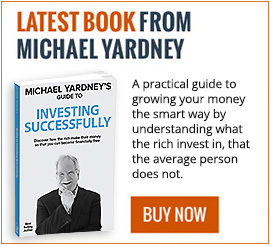 This is the hole the RBA’s new research is trying to fill. Given uncertainty is not observable, RBA economist Angus Moore has created an index to measure whether uncertainty is increasing or decreasing. The index combines four measures of uncertainty. The first is keywords (“budget”, “policy” and so on) from newspaper articles. 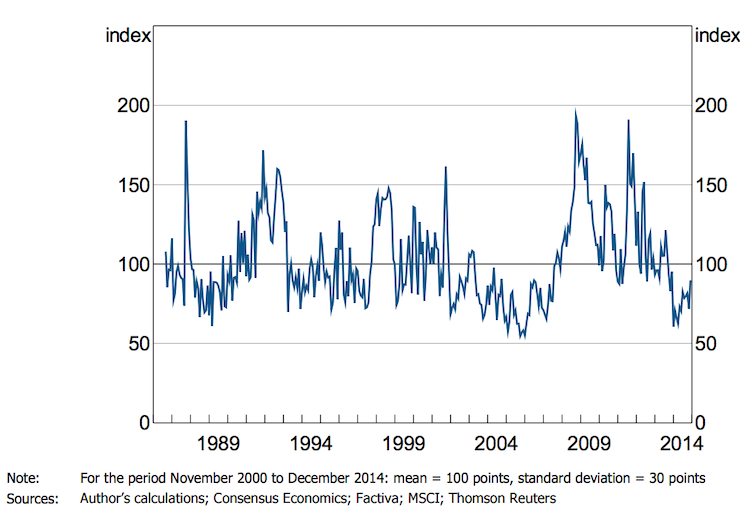 The second is financial indicators (mainly, financial market volatility). The last two measures are the variance in earnings forecasts for ASX 200 companies, and GDP growth forecasts. These last two give us approximations of the uncertainty facing entrepreneurs and the Australian economy more generally. The result is an Australian economic uncertainty index, ranging from 1986 to 2016. 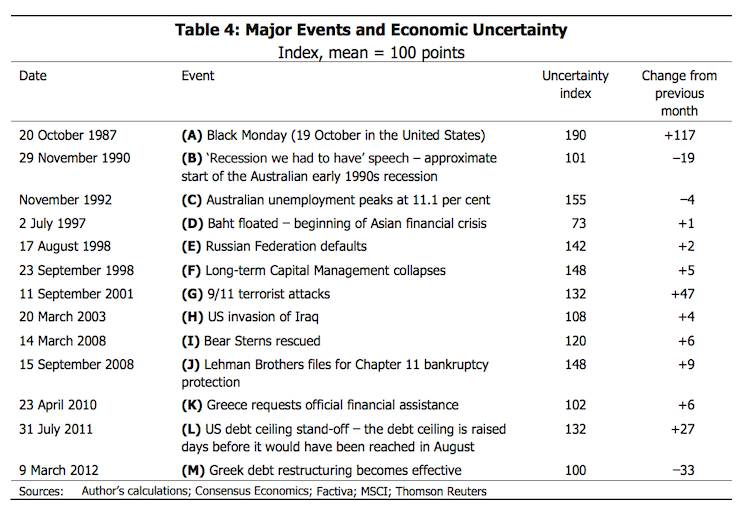 The uncertainty index correlates with a variety of events, from domestic ones such as Paul Keating’s “recession we had to have” speech, to external shocks like the 9/11 terrorist attacks, the Lehman Brothers’ bankruptcy and, more recently, the Brexit vote and the 2016 US presidential election. Not all big events were found to generate uncertainty, however. The Greek government’s debt restructuring in March 2012, for instance, corresponds to a decrease in the uncertainty index. 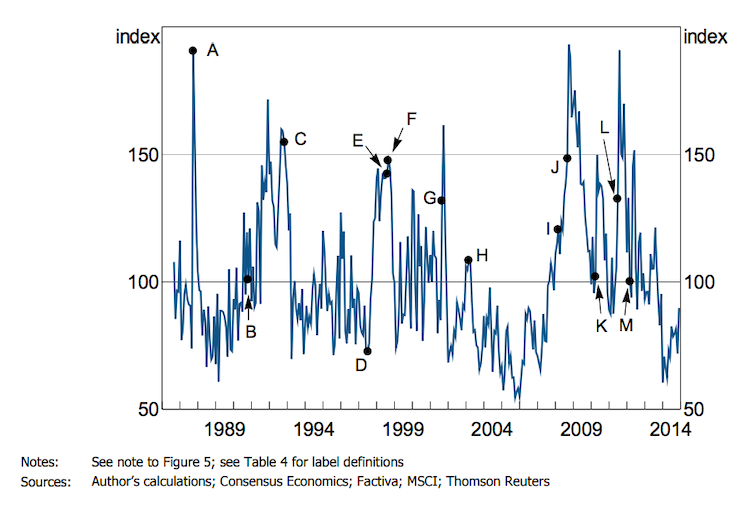 Correlation of major events and economic uncertainty. But when we check the relationship between the index and key macroeconomic indicators such as unemployment, the correlation is not as clear. If a hike in uncertainty is one of the reasons behind high unemployment and low growth, unemployment should rise with increasing uncertainty. However, Moore’s research does not show this. To be clear, the research does not claim that uncertainty is unimportant. 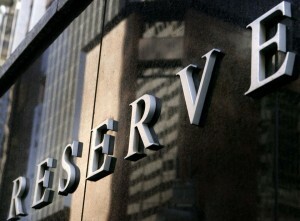 If the RBA had not cut interest rates in response to high uncertainty, Australia could have experienced a recession. 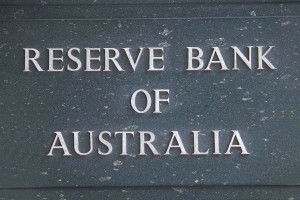 For example, the RBA cut rates from 7.25% to 3% between August 2008 and May 2009, to stimulate Australia’s aggregate demand during the global financial crisis. Using economic models, Moore found that if uncertainty were to suddenly materialise in a world that had never been hit by an economic shock it would result in lower employment growth, weaker retail sales growth, and a fall in consumer confidence. But the impact is small. 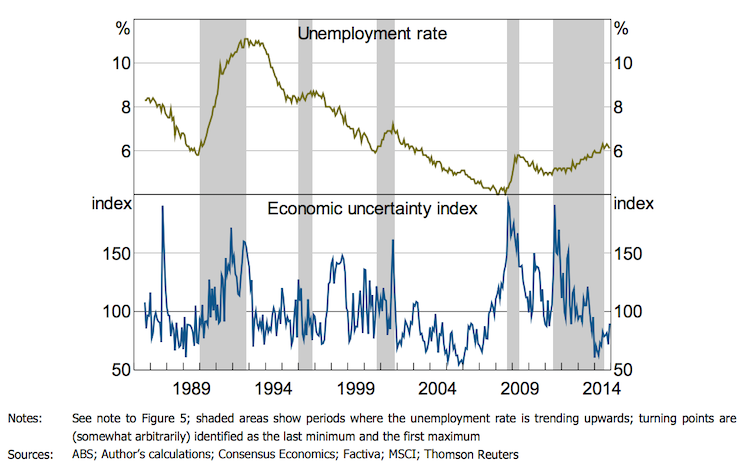 For instance, the reaction of employment growth to a modestly sized shock to uncertainty is estimated to be about one-sixth of a percentage point after four months. This may be due to the prompt response of the RBA, which is assumed to cut the cash rate in response to the heightened uncertainty. 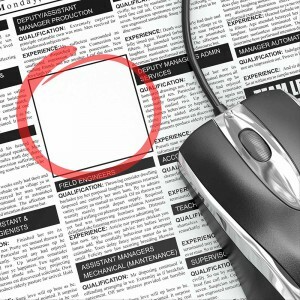 The finding that an uncertainty shock results in only a modest response in the labour market is in line with recent research conducted at the Melbourne Institute, where economists have compared the effects of an uncertainty shock in the US and in Australia. They have found a comparable increase in uncertainty exerts a much stronger effect on the US unemployment rate than on the Australian one. Two reasons seem to be behind this difference. First, uncertainty shocks are more harmful when an economic system is already weak. When it is experiencing a recession, for example. Second, such shocks are very harmful when a central bank cannot cut interest rates. While the US has experienced both situations in the last two decades, Australia has not. 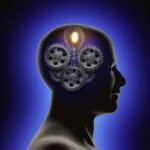 Uncertainty isn’t the cause of our current malaise, it could still pose problems in the future. To avoid the costs of uncertainty, policymakers should actively work to reduce it, by communicating as clearly as possible their policies and future interest rate moves. This lesson comes from the United States, where the data tells us that uncertainty about economic policies like future government spending and monetary policy decisions is a drag on the economy. If uncertainty builds up anyway, policymakers need to act fast. They should temporarily increase government spending and cut interest rates, to quickly restore confidence and strengthen the demand for consumption and investment. And, again, clearly explain the reason behind such policy moves. There is nothing like a well understood policy to reduce economic policy uncertainty.